In 2013, Rye will be hosting the District Tournament for the State of New Hampshire Little League road to Pennsylvania. We have been working together as a league to make general improvements to the field and we appreciate all that you have contributed both financially and with your time. Once again, volunteers are needed with skills that can help us with a new snack shack. We hope to have the new building in place this fall. Please contact Paul Predaris at: if you can help in any way. We really appreciate your talents to make this happen! Thank you. 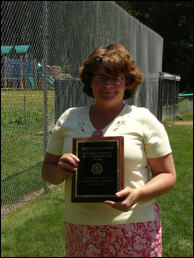 In 2001, the Rye Little League Board of Directors created an award for outstanding volunteer service. This award is presented to those dedicated individuals who have volunteered their time, efforts and abilities to the Rye Little League in such an outstanding fashion as to be worthy of lasting recognition and gratitude. John Sexton was the first recipient and it was named after him - the John Sexton Volunteer Award. At that time, Mr. Sexton was honored for his 22 years of volunteer service. He has never had a child in the league, yet he gives his time so readily. Congratulations to Shari Turner who won the John Sexton Volunteer Award in 2010!